The Internet of Things (IoT) brings the potential for disruptive transformation and game changing capabilities. Analysts predict billions and billions of IoT devices by 2020. So why isn’t everyone buying IoT? Today’s buyers face immature point solutions that are still changing with emerging use cases and evolving technology standards. Furthermore, many of these solutions are created by start-ups that may not be around a year or two from now. Finally, given the dynamic changes in the market, IoT solutions face the possibility of early obsolescence. In this emerging market, what can IoT solution vendors do to sell more? This post describes eight things vendors should stop doing, along with eight things that they should be doing. The Internet of Things or IoT is one of the hottest marketing buzzwords in the technology industry over the past couple of years. Unfortunately for you, most of your future customers work outside the technology industry. Many have never heard of IoT, and if they have, they don’t care. Start describing your solution in the same everyday words that your customers use to address the problems they care most about. For example, your customers care about optimizing their costs of operating a nationwide fleet of freight trucks. You don’t have an IoT solution. You have a solution that helps them minimize truck downtime, maximizes the number of trucks on the road, while minimizing the operating costs per truck and managed with the least amount of people. IoT is cool. From intelligent edge devices that transmit data over several miles using low power wide area networks (LPWANs) to an IoT platform in the cloud, to machine learning algorithms that interpret the data and make optimized recommendations that are carried out at the edge. It’s too bad customers don’t buy “cool” technology. Start selling solutions to real world problems that your customers care about. Find their top problems, validate these “use cases”, and build your technology and services solution around those. Then prove it using your solution. Stop going to IoT conferences. IoT conferences are great for learning about IoT. Where else can you go and learn about the latest IoT technologies, meet IoT vendors, hear IoT experts pontificate about the next “big thing” and meet like-minded professionals? It’s just too bad your customers don’t attend these IoT conferences. Start going to the main conferences that your customers attend. Have an IoT solution for fleet management? Attend the NAFA Fleet Management Association Institute and Expo conference. Have a solution for the mining industry? Attend the International Mining and Resources Conference. 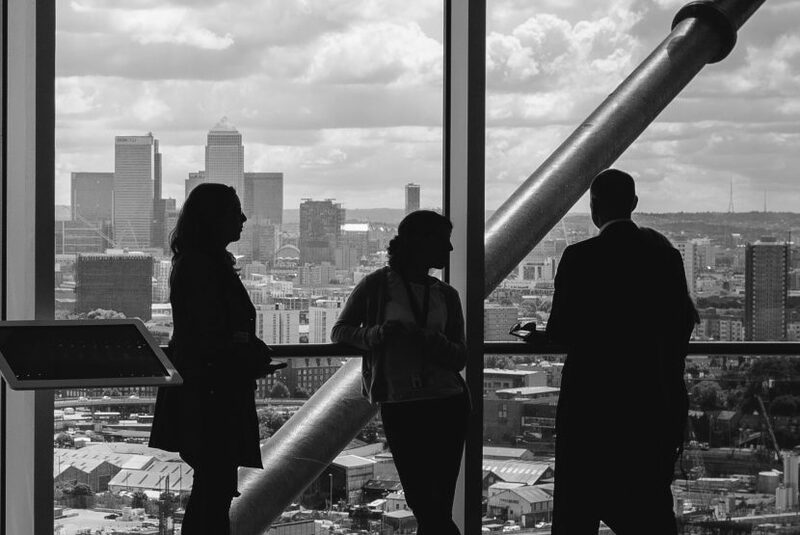 You won’t find many IoT experts or vendors at these conferences, but you will find many customers that need your solution. Stop looking for customers who have budget. In an emerging market, the customers who have budget for your solution are early adopters. They take the time to understand your technology, give you feedback to improve your solution, and are willing to buy it despite its limited functionality and performance. It’s too bad there aren’t enough early adopters to sustain you and everyone else in the marketplace. Start looking for customers who will free up budget for your solution. These are the customers for whom your solution has such compelling value, they can’t afford not to have it immediately. They are mining companies that require predictive maintenance because a broken excavator means millions of dollars in lost revenue per day. They are fleet managers whose trucks can be dispatched proactively to anticipate customer needs and secure new pickups (and revenue) before the competition can react. Imagine yourself as the customer. You are faced with over 350 IoT platforms in the marketplace with no standardized definition of what an IoT platform is. Then you have to choose between multiple competing wireless connectivity options, and that doesn’t include the pending launch of 5G. 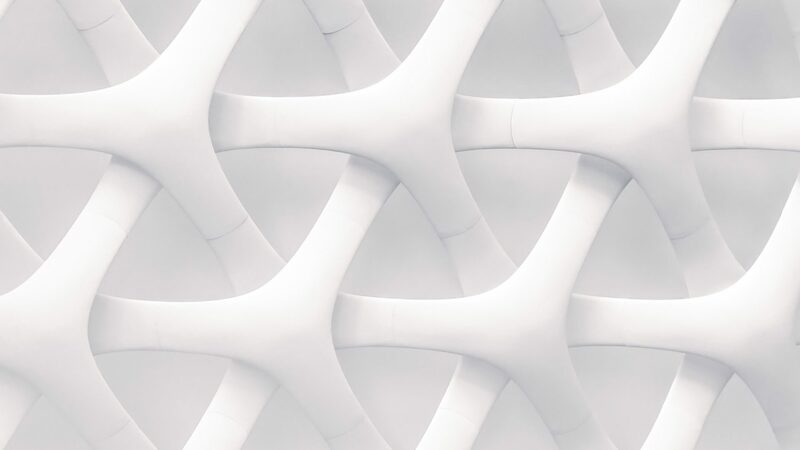 You look to vendor websites for more information but are hit with buzzwords such as as gateways, edge computing, AI, machine learning, data analytics, “as a service”, and so on. Even if you wanted to buy, imagine trying to make a decision in this environment. Start educating your customers. Confusion and lack of awareness reign in an early market. Provide your customers with the necessary and unbiased foundation to understand what IoT is and does, its underlying components and how it works through webinars, content marketing and other trainings. Provide them with a strategy to incorporate IoT technologies into their organizations and a framework to help define what they need. Your customers are inundated with marketing messages daily. Emails, phone calls, text messages and faxes. Online ads and social media posts. Podcasts and videos. “Free” webinars. This is exacerbated in the current market where there are more IoT vendors than the market can ultimately support. In this environment, your customer is not only more confused than ever, but has developed an immunity to your marketing. Start partnering with influencers, thought leaders, analysts, and consultants that break through the “noise” and reach your customer. While you shouldn’t totally stop your traditional marketing efforts, allocate some of your resources to these channels. One reason why these channels work better is that they are perceived as non-biased and provide a bigger picture perspective than any single vendor can provide. Stop working against your channel. You designed your solution with a perfect product-market fit for the customer, but forgot about the people who sell and install your solution. While your solution produces tangible value for the end-user, it adversely affects the channel resellers’ revenue and profitability, disintermediates them, or make it harder for them to do business with you. Given this reality, your channel resellers have no incentive to promote your solution. Start partnering with your reseller and service providers to reduce channel friction. Co-create your solution with your channel to capture product-market fit from their perspective. Develop marketing programs that incentivize your channel to pursue new sustainable opportunities. Help your channel identify suitable niches within their existing customer base that don’t conflict with their existing interests. Despite the connected nature of IoT solutions, IoT is not Information Technology (IT). It is more like industrial technology, or operations technology than information technology. IoT solutions are involved in the primary value creation activities of an organization (products and services) while IT solutions support those activities. Start finding and selling to IoT buyers. They don’t belong to a single centralized organization like IT, but are scattered across multiple organizations internally. They come from marketing, support, manufacturing, and operations. IoT buyers have a different mission and reasons for buying. While IT is involved in the buying decisions, they may not be the primary decision-makers. In order for a purchase to actually happen, IoT and IT buyers will coordinate among themselves over roles and responsibilities, budget allocation and transfer, and resource allocations. 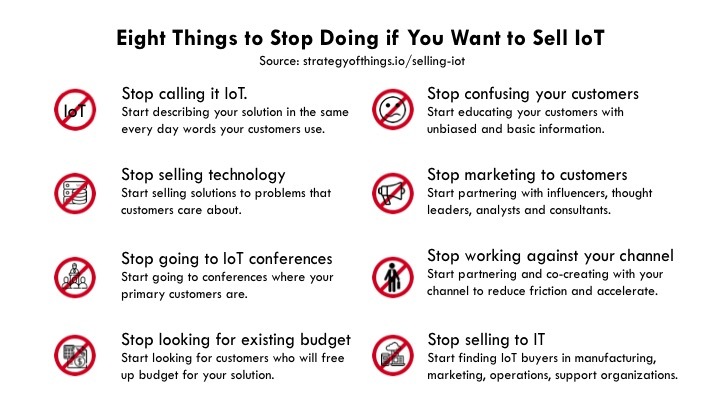 Selling IoT? Don’t forget about the channel! Awesome Article, would like to share with my peers !